Payment Instructions: 10% ONSITE BUYERS PREMIUM ON HAMMER PRICE FOR ALL ITEMS. ADDITIONAL 2% BUYER'S PREMIUM FOR ALL ONLINE PURCHASES. 3% SERVICE CHARGE FOR ALL PAYMENTS MADE WITH CREDIT CARDS. YOUR CREDIT CARD WILL BE AUTHORIZED AT REGISTRATION WITH A HOLD OF $1,000.00 BY OUR CARD PROCESSOR. FOR NON WINNING BUYERS, PLEASE NOTE THE CREDIT CARD HOLD WILL BE RELEASED WITHIN 48 HOURS OF CLOSE OF AUCTION BY JOEY MARTIN AUCTIONEERS LLC. ALSO UNDERSTAND SOME BANKS WILL NOT SHOW THIS RETURN FOR UP TO 7 BANKING DAYS. Checkout Date & Times: ALL ITEMS MUST BE REMOVED FROM AUCTION SITE NO LATER THAN, SATURDAY MARCH 30, 2019 AT 4:00 PM. NO SUNDAY LOAD OUT. ALL ITEMS LEFT OVER NIGHT WILL BE FULL RESPONSIBILITY OF BUYER. Payments: Payment is due in full on auction day on all purchases. Purchases can be paid with cash, credit card, cashier's check, company check. ALL company checks must have a current bank guarantee letter made to Joey Martin Auctioneers, LLC guaranteeing payment. Wiring Instructions 1.Bank Routing Number: 053100300 2.Bank Name: First Citizens Bank 1508 E. Greenville Street Anderson, SC 29621 3.Beneficiary Account Name: Joey Martin Auctioneers LLC (Escrow Acct) 4.Beneficiary Account Number: 009160310893 5.Swift Code for international wires FCBTUS33 State Sales Tax: 9% AL sales tax applies to all items purchased, unless a resale certificate is on file with Joey Martin Auctioneers, LLC. Warranty: ALL ITEMS ARE SOLD AS IS, WHERE IS, WITH NO WARRANTIES OR GUARANTEES. NO REFUNDS WILL BE ISSUED. ALL SALES ARE FINAL. Credit Card Terms: We accept Visa, Master Card, Discover, & American Express. An additional 3% charge for credit card payment will be added to invoice. All credit card sales are final, no refunds on credit card payments. Additional Terms: An additional $50.00 fee will be added to all titled items sold. Also, Ad Valorem Tax will be applied to titled items for Georgia Residents where applicable. Occasionally an item must be removed from the auction due to circumstances beyond our control. If there is an item that you are interested in, please call ahead of time to ensure that it is registered into the auction. ALL ITEMS MUST BE REMOVED FROM AUCTION SITE NO LATER THAN, SATURDAY, MARCH 30, 2019 AT 4:00 PM. NO SUNDAY LOAD OUT. ALL ITEMS LEFT OVER NIGHT WILL BE FULL RESPONSIBILITY OF BUYER. MILLER BLUE STAR 185 DC WELDER, 6000 WATT GENERATOR, 12.75 HP KOHLER GAS ENGINE WITH ELECTRIC START, AUTO IDLE, 1 240V PLUG, 4 120V PLUG, 81.2HRS. MILLER BLUE STAR 185 DC WELDER, 6000 WATT GENERATOR, 12.75 HP KOHLER GAS ENGINE WITH ELECTRIC START, 1 240V PLUG, 4 120V PLUG, 44.0HRS. 2007 FORD F150 XLT 4X4 TRUCK, 4DR EXTENDED CAB, 5.4L TRITON GAS ENGINE, AUTO TRANS, FLOOR 4WD SELECTOR, POWER W/L, AM/FM/CD RADIO, 2IN TOW PACKAGE, REESE BRAKE CONTROLLER, SPRAY IN BED LINER, P265/70R17, 257,827 MILES, 1FTPX14V87NA60899. 2006 FORD F150 XL 4X4 TRUCK, 4DR EXTENDED CAB, TRITON 5.4L GAS ENGINE, AUTO TRANS, FLOOR 4WD SELECTOR, POWER W/L, AM/FM/CD RADIO, PLASTIC BED LINER, 2IN TOW HITCH, REESE TRAILER BRAKE CONTROLLER, R17 TIRES, 290,475 MILES, VIN: 1FTPX14V26NA92388. 2005 FORD F150 XL 4x4 TRUCK, 5.4L Triton Gas engine, auto trans, manual w/l, in floor 4wd selector, cloth interior, 4dr extended cab, patriot plastic bed liner, 2inch tow package, P245/70R17, 198,978 miles, VIN: 1FTPX14575KD79273. 2002 CHEVY 1500 4X4 TRUCK, 5.3L VORTEC GAS ENGINE, AUTO TRANS, MANUAL W/L, AM/FM RADIO, BUCKET SEATS, 4DR EXTENDED CAB, CLOTH INTERIOR, IN FLOOR 4WD SELECTOR, BED LINER, LT265/75R16 TIRES, 313,553 MILES, VIN: 2GCEK19T321367226. 2001 FORD RANGER TRUCK WITH CAMPER SHELL, 3.0L GAS ENGINE, AUTO TRANS, AM/FM/CD RADIO, MANUAL W/L, VINYL INTERIOR, P225/70R15 TIRES, 183,792 MILES, VIN: 1FTYR10V2YPC01007. 2006 FORD F350 XL SUPER DUTY SERVICE TRUCK W/ KNAPHEIDE 8' SERVICE BODY, 6.0L POWER STROKE V8 TURBO DIESEL, AUTO TRANS, 4DR EXTENDED CAB, SINGLE REAR WHEELS, MANUAL W/L, AM/FM/RADIO, CRUISE CONTROL, 2" REAR TOW PACKAGE, CHAMPION ELECTRIC START AIR COMPRESSOR, 2:AIR HOSE REELS, 4:5' SLIDING TOOL DRAWERS, AMERICAN EAGLE SLIDING TOOL DRAERS, MICHELIN LT265/70R17, 201,802 MILES, VIN: 1FDWX30P36ED09702. 2006 FORD F350 XL SUPER DUTY SERVICE TRUCK, W/ 8' KNAPHEIDE SERVICE BODY, 6.0L POWER STROKE V8 TURBO DIESEL, AUTO TRANS, SINGLE REAR WHEELS, MANUAL W/L, AM/FM/CD RADIO, CRUISE CONTROL, VINYL BENCH SEATS, 2" REAR TOW PACKAGE, 4: 5' SLIDING TOOL DRAWERS, MICHELIN LT265/70R17 TIRES, 154,903 MILES, 1FDWX30P16ED86200. 2008 FORD F350 XL SUPER DUTY SERVICE TRUCK, W/ KNAPHEIDE 8' SERVICE BODY, 6.4L V8 POWERSTROKE DIESEL ENGINE, AUTO TRANS, 4DR EXTENDED CAB, SINGLE REAR WHEELS, MANUAL W/L, VINYL BUCKET SEATS, AM/FM/CD RADIO, 2" REAR TOW PACKAGE, CHAMPION GAS POWERED ELECTRIC START AIR COMPRESSOR, AMERICAN EAGLE SLIDING TOOL DRAWERS, LT265/70R17 TIRES, 178,736 MILES, VIN: 1FDWX30R38EB42908. 2008 FORD F350 XL SUPER DUTY SERVICE TRUCK, W/ 9' OMAHA SERVICE BODY, 6.4L POWER STROKE V8 TURBO DIESEL, AUTO TRANS, 4DR EXTENDED CAB, DUAL REAR VWHEELS, MANUAL W/L, BUCKET VINYL SEATS, AM/FM/CD RADIO, UPFITTERS SWITCHES, AMERICAN EAGLE SLIDING TOOL DRAWERS, 4: 6' SLIDING TOOL DRAWERS, ONBOARD VMAC AIR COMPRESSOR SYSTEM, AIR HOSE REEL, 2" REAR TOW PACKAGE, MICHELIN LT245/75R17 TIRES, 210,659 MILES, VIN: 1FDWX36R08EC00545. 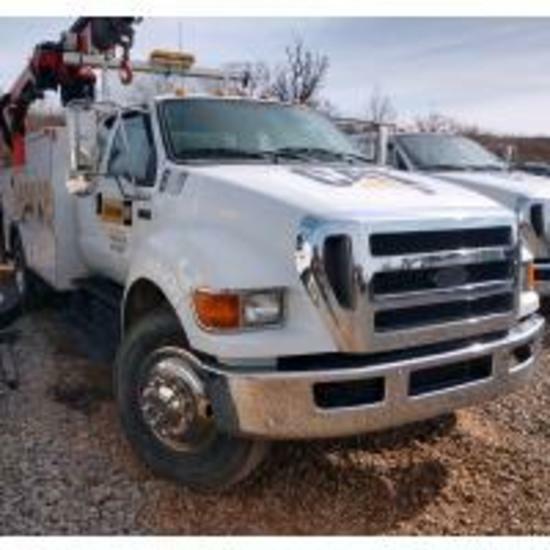 2009 FORD F550 XL SUPER DUTY SERVICE TRUCK, W/ OMAHA 10' SERVICE BODY W/ AUTO CRANE, 6.4L V8 POWER STROKE TURBO DIESEL, AUTO TRANS, 4DR EXTENDED CAB, PWR W/L, CRUISE CONTROL, AM/FM/CD RADIO, MANUAL OUTRIGGERS, VMAC ELIMINATOR 70 AIR COMPRESSOR, MICHELIN 225/70R19.5 TIRES, 212,909 MILES, VIN: 1FDAX56R69EA50934. 2006 FORD E350 SERVICE/CARGO VAN, 5.4L GAS ENGINE, AUTO TRANS, WALK THRU CARGO GUARD, MANUAL W/L, CRUISE CONTROL, AM/FM RADIO, LT245/75R16 TIRES, 153,439 MILES, VIN: 1FTSS34L76DA93092.